"We did 180 shows on the Death Magnetic tour in two-week periods over three years," Ulrich tells Rolling Stone. "That's what works for us. We're going to start pretty much full-on touring in January and are looking to figure out what we're doing in North America, but there will definitely be some pretty extensive touring in America." Metallica haven't played a proper American arena tour since 2009. "It's time to come back," adds the drummer, "and do some proper penetration of America." 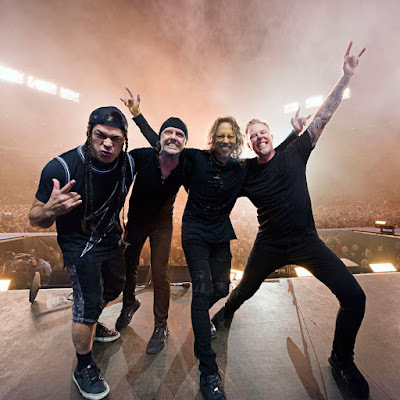 Due November 18, the two-disc set “Hardwired…To Self Destruct” was recently previewed with the release of a video for the lead track “Hardwired,” and the band performed the live debut of the song at the U.S. Bank Stadium in Minneapolis, MN on August 20 following its premiere on August 18. Metallica currently have a pair of shows on their 2016 calendar, including a September 24 appearance at the Global Citizen Festival in New York’s Central Park and acoustic sets at Neil Young’s 30th anniversary Bridge School Benefit Concert weekend in late October.